The flow of traffic in a congested areas of Poznan with very slow moving heavy trucks needed to be improved. Reconditioning a 500 metre stretch of two way carriageway between ul. św. Wawrzyńca and ul. Jana Henryka Dąbrowskiego was seen to be the way to alleviate the problem. This required a special asphalt mix and a high performance bitumen to cope with the traffic that consisted mainly of heavy vehicles. Nynas' Extra grade Nypave FX 25 PL was used in a very high modulus pavement surface construction (also known as EME). Nynas Extra grades of bitumen have special characteristics and are focussed on tailored specifications. Nypave FX 25 PL fits well into this category. The high specific modulus surface comprised a foundation base course layer and a binder course using a hard bitumen with a special 20/30 penetration. This type of construction provides a road with high load bearing capacity, durability and high resistance to deformation, thermal and dynamic forces which could lead to fatigue cracking. Nypave FX 25 PL is made with Straight Run components and not with heavy oxidised components which are ageing sensitive. In order to meet the requirements of the GDDKIA Laboratory in Poznan, the design of the 0/16mm basalt asphalt mix was made with 5.1% Nypave 25FXPL binder (which ensures such high parameters can be achieved). The void content of the mix was approximately 4%. To provide a suitably durable road, the construction consisted of a 12cm base course layer combined with an 8cm binder course, both made with Nypave FX 25 PL bitumen. The base and binder layer were compacted with a rubber tyred roller and two steel wheel vibrating rollers weighing 8 and 10 tonnes. 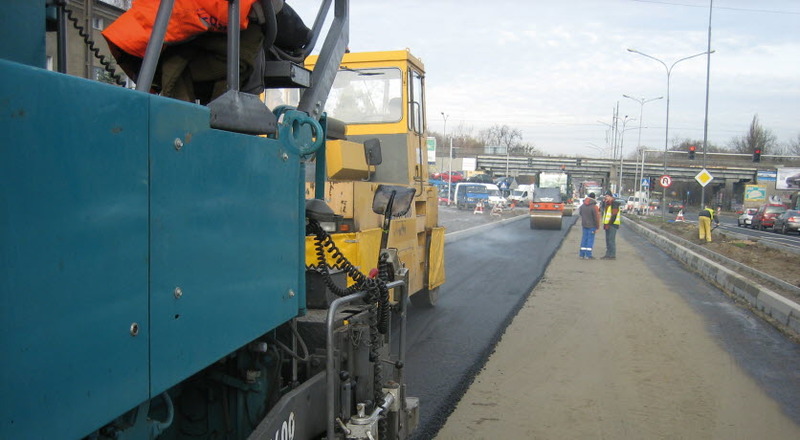 In order to minimise traffic noise, a 3cm thick SMA 8 with Nypol 86 polymer modified bitumen was used for the surface layer. Nypol 86 is another of Nynas' Extra innovative grades of bitumen with characteristics that can successfully meet special requirements. These innovative solutions to the problem also meant that the thickness of the base and binder layers was reduced from the usual 25cm to 20cm without a reduction in fatigue life. The new layer has ensured a high bearing capacity, long term durability and enhanced resistance to cracking. Thanks to the applied solution the thickness of the base and binding layers was changed from the usual 25cm to 20cm. The new layer ensures a high bearing capacity, durability, longevity and resistance to cracking. Download this information on how Nypave FX 25 PL was used at UL. Żeromskiego, Poznan, Poland, as pdf.